AWS Elastic Beanstalk provides several options for how deployments are processed, including deployment policies (All at once, Rolling, Rolling with additional batch, and Immutable) and options that let you configure batch size and health check behavior during deployments. By default, your environment uses all-at-once deployments. If you created the environment with the EB CLI and it's an automatically scaling environment (you didn't specify the --single option), it uses rolling deployments. With rolling deployments, Elastic Beanstalk splits the environment's EC2 instances into batches and deploys the new version of the application to one batch at a time, leaving the rest of the instances in the environment running the old version of the application. During a rolling deployment, some instances serve requests with the old version of the application, while instances in completed batches serve other requests with the new version. To maintain full capacity during deployments, you can configure your environment to launch a new batch of instances before taking any instances out of service. This option is known as a rolling deployment with an additional batch. When the deployment completes, Elastic Beanstalk terminates the additional batch of instances. Immutable deployments perform an immutable update to launch a full set of new instances running the new version of the application in a separate Auto Scaling group, alongside the instances running the old version. Immutable deployments can prevent issues caused by partially completed rolling deployments. If the new instances don't pass health checks, Elastic Beanstalk terminates them, leaving the original instances untouched. If your application doesn't pass all health checks, but still operates correctly at a lower health status, you can allow instances to pass health checks with a lower status, such as Warning, by modifying the Healthy threshold option. If your deployments fail because they don't pass health checks and you need to force an update regardless of health status, specify the Ignore health check option. When you specify a batch size for rolling updates, Elastic Beanstalk also uses that value for rolling application restarts. Use rolling restarts when you need to restart the proxy and application servers running on your environment's instances without downtime. In the environment management console, enable and configure batched application version deployments by editing Updates and Deployments on the environment's Configuration page. In the Application Deployments section, choose a Deployment policy, batch settings, and health check options. All at once – Deploy the new version to all instances simultaneously. All instances in your environment are out of service for a short time while the deployment occurs. Rolling – Deploy the new version in batches. Each batch is taken out of service during the deployment phase, reducing your environment's capacity by the number of instances in a batch. Rolling with additional batch – Deploy the new version in batches, but first launch a new batch of instances to ensure full capacity during the deployment process. Immutable – Deploy the new version to a fresh group of instances by performing an immutable update. Batch size – The size of the set of instances to deploy in each batch. Choose Percentage to configure a percentage of the total number of EC2 instances in the Auto Scaling group (up to 100 percent), or choose Fixed to configure a fixed number of instances (up to the maximum instance count in your environment's Auto Scaling configuration). The Deployment preferences section contains options related to health checks. When processing a batch, Elastic Beanstalk detaches all instances in the batch from the load balancer, deploys the new application version, and then reattaches the instances. If you enable connection draining, Elastic Beanstalk drains existing connections from the Amazon EC2 instances in each batch before beginning the deployment. After reattaching the instances in a batch to the load balancer, Elastic Load Balancing waits until they pass a minimum number of Elastic Load Balancing health checks (the Healthy check count threshold value), and then starts routing traffic to them. If no health check URL is configured, this can happen very quickly, because an instance will pass the health check as soon as it can accept a TCP connection. If a health check URL is configured, the load balancer doesn't route traffic to the updated instances until they return a 200 OK status code in response to an HTTP GET request to the health check URL. Elastic Beanstalk waits until all instances in a batch are healthy before moving on to the next batch. With basic health reporting, instance health depends on the Elastic Load Balancing health check status. When all instances in the batch pass enough health checks to be considered healthy by Elastic Load Balancing, the batch is complete. If enhanced health reporting is enabled, Elastic Beanstalk considers several other factors, including the result of incoming requests. With enhanced health reporting, all instances must pass 12 consecutive health checks with an OK status within two minutes for web server environments, and 18 health checks within three minutes for worker environments. If a batch of instances does not become healthy within the command timeout, the deployment fails. After a failed deployment, check the health of the instances in your environment for information about the cause of the failure. Then perform another deployment with a fixed or known good version of your application to roll back. If a deployment fails after one or more batches completed successfully, the completed batches run the new version of your application while any pending batches continue to run the old version. You can identify the version running on the instances in your environment on the health page in the console. This page displays the deployment ID of the most recent deployment that executed on each instance in your environment. 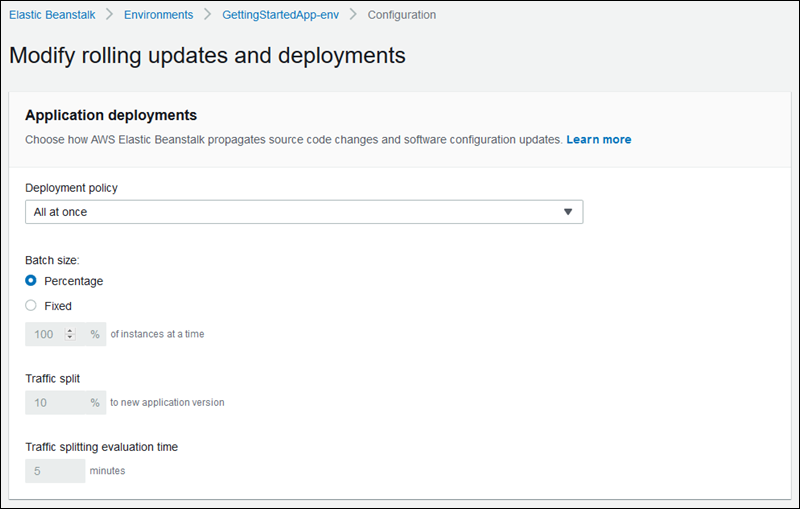 If you terminate instances from the failed deployment, Elastic Beanstalk replaces them with instances running the application version from the most recent successful deployment. You can also use the configuration options in the aws:elasticbeanstalk:command namespace to configure rolling deployments. AllAtOnce – Disables rolling deployments and always deploys to all instances simultaneously. Rolling – Enables standard rolling deployments. RollingWithAdditionalBatch – Launches an extra batch of instances, before starting the deployment, to maintain full capacity. Immutable – Performs an immutable update for every deployment. When you enable rolling deployments, set the BatchSize and BatchSizeType options to configure the size of each batch. For example, to deploy 25 percent of all instances in each batch, specify the following options and values. To deploy to five instances in each batch, regardless of the number of instances running, and to bring up an extra batch of five instances running the new version before pulling any instances out of service, specify the following options and values. To perform an immutable update for each deployment with a health check threshold of Warning, and proceed with the deployment even if instances in a batch don't pass health checks within a timeout of 15 minutes, specify the following options and values.